Today marks the first entry that will form part of the Nobel Prize in Economics Profile series. Accumulating these profiles, and providing, not only a summary, but an opinion on each, will hopefully provide various rewards: economic knowledge, true social science awareness and inspirational accounts to learn from. The premise herein: one has to study the events of the past, to live the active present, which ultimately leads to envisioning a future. One of my greatest regrets was to have approached mathematics begrudgingly during my formative years. Had I gone beyond the usual dry learning approach and realized the philosophy behind the subject and how speaking it would serve me in multiple forms, I wouldn't have waited until college to take it seriously. Any mathematician, math teacher and math enthuthiast can attest to its beauty. Mathematics is usually an underestimated disciplines, yet anyone who decides to venture into the private sector can surely add value. When it comes to Economics - the following winners, were not only fluent in Mathematics; they used it to their advantage; revolutionizing economics from thereon. 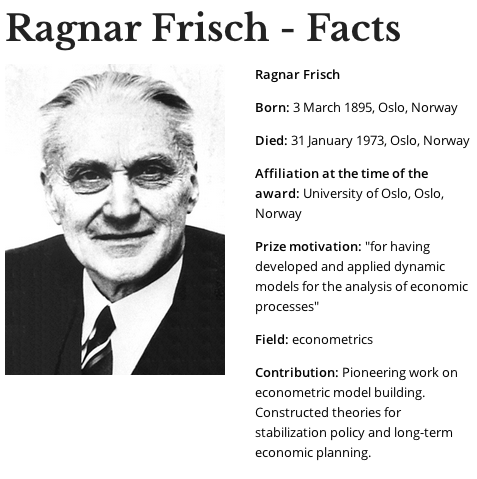 The Sveriges Riksbank Prize in Economic Sciences in Memory of Alfred Nobel 1969 was awarded jointly to Ragnar Frisch and Jan Tinbergen "for having developed and applied dynamic models for the analysis of economic processes"
These two Economists revolutionized the field of Economics, having founded Econometrics - the discipline that gave way to the formal quantitative analysis that most economic concepts and theories lacked until that point. 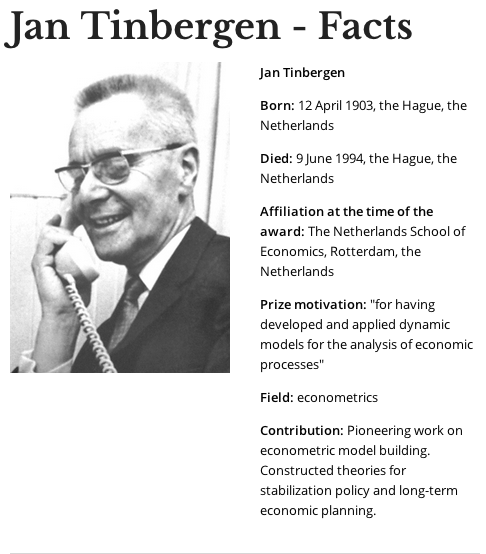 Jan Tinbergen also (assumedly - but surely not a mere factoid) promoted the terms "Macroeconomics" and "Microeconomics", before these two economic branches were in common use. I have decided to start a Nobel Prize in Economics Profile Series - starting this upcoming weekend. 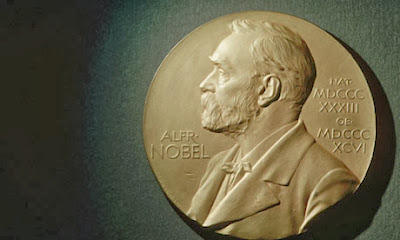 I will be profiling, in chronological order, every Nobel Prize in Economics Winner dating from 1969 (when the first ever was awarded), up till this year's, and, every year after that. The prizes that were awarded closely mirrored the changing facets that came with Economics through the years - profiling the winners is like peering through very interesting (and inspirational) windows. There is much to learn from them. It will be a self-rewarding experience that I will thoroughly enjoy, and through this blog, have a chance to archive. 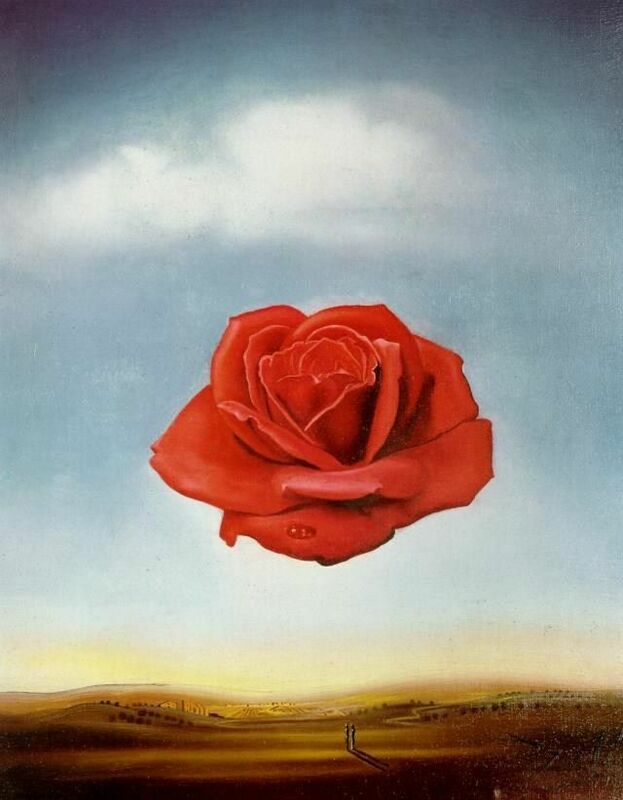 A rose blooming on its own. At what cost do people pursue their goals? For the authentically ambitious person, who craves achievement above all else, unswerving dedication to the pursuit of personal dreams and goals can limit the amount of time that is spent on anything else. Personal relationships can suffer momentary lapses in undivided attention. An article from The Atlantic explains how, in the end, people ultimately determine that "relationships are more important than ambition," and how "ambition drives people forward; relationships and community, by imposing limits, hold people back." That he coined that phrase should come as no surprise, given how he handled his personal life. Franklin was often away from home, from one adventure to the next, leaving those close to him to fend for themselves. He was a doting husband in spirit, but was mostly absent from his wife's life. He was also intermittently estranged from his own son. Regardless, the man did contribute a lot to his country, and to the world. Walter Isaacson's account of Franklin's personal foibles paint an interesting picture; one that makes you realize, that personal ambition is not always a sinful passion, or at least not when the person in question contributes and adds value in some way. Most world leaders, artists, inventors, innovators and geniuses fit this mold. And most had satisfying personal lives - in terms of the ardor, dedication and devotion that came in spurts of intensity to those around them. The cost behind the pursuit of personal goals, must then, be regarded as a function of the results they render. So, to complement the question, "at what cost do people pursue their goals", I would add, "at what price would people value other's contributions?"